Quality early STEM experiences provide a critical foundation for learning about science, technology, engineering, and mathematics (STEM) in ways that facilitate later learning. Early childhood educatorshave a unique opportunity to benefit all students by bringing the STEM disciplines into greater balance with literacy, reducing early inequities in access and opportunity to learn STEM, and developing skills and understandings that students can build on as they progress through school and into civic life and the workforce. Sarama, J., Clements, D., Nielsen, N., Blanton, M., Romance, N., Hoover, M., Staudt, C., Baroody, A., McWayne, C., and McCulloch, C., (2018). 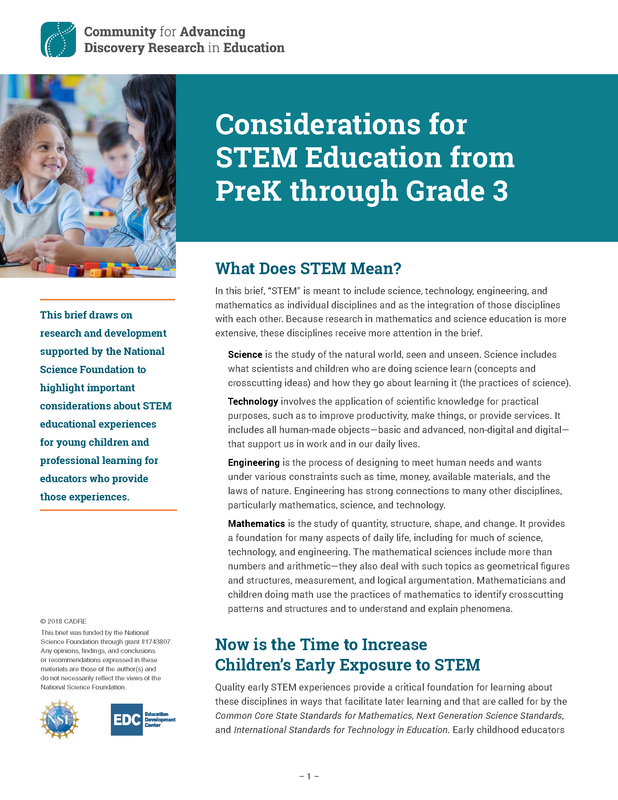 Considerations for STEM education from PreK through grade 3. Waltham, MA: Education Development Center, Inc. Retrieved from http://cadrek12.org/resources/considerations-stem-education-prek-through-grade-3.